My two boys have been bringing their Easter baskets to the North Branch Reformed Church’s annual Easter Egg Hunt since they were toddlers. The church’s senior high youth group stuffs eggs with nut-free candies and symbols of Easter, like feathers, coins, and crosses. Then, they spread hundreds of eggs on the church lawn and playground. Families meet in Fellowship Hall and are given directions as to where each age-group will go for their hunt. Once all the eggs are found, everyone returns to Fellowship Hall to hear our Youth Pastor, Mark Swart, retell the Easter Story. EVERYONE is welcome to attend ~ Preschool Families, church members, non-church members, neighbors, and friends! 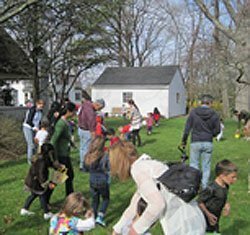 This year’s Easter Egg Hunt will be held on Saturday, March 23rd at 10am. Bring your baskets and we’ll see you then.